If there’s one thing that can kill a relationship or marriage, it’s when one partner wants more passion, physical attention and touch than their partner wants.Now you might think that it’s the men who want more passion and it the women who tend to lose interest in it over the years but in the “real” world, it’s just not so. We hear from plenty of women who want more passion from their men–(more love-making and more touching)–as well as men who can’t figure out how to get their partners to love them the way they used to.It’s great when both people in a relationship have the same level of interest and desire for physical intimacy, but it doesn’t always work out that way. There’s usually a difference between the desire level of the two people–and desire levels can change from time to time depending on life events and circumstances like birth of a child, fluctuating hormones, medication, illness and death of someone close. How you navigate that difference can mean whether you are happy and stay together or miserable and eventually end the relationship. As unromantic as it sounds, you have to decide to make passion a priority in your relationship or it just may not happen. She also suggests that when passionate intimacy goes, so does cuddling, holding hands and any type of touch between the two people. Well you can fill in the rest. This doesn’t mean that you just go through the motions with your partner, staring at the ceiling until it’s over. It means that if you love each other and there’s tension between the two of you about how much physical intimacy you want in the relationship, you look at what’s going on without the usual guilt and blame and decide that you’re going to take action to get closer. As we said before, the two of you have to decide that your desire for one another is a choice and you are going to say “yes” to it. Saying “yes” to desire will look different for every couple and doesn’t just mean how many times a week they make love. Despite what’s on the magazine covers in the grocery check-out line–there is no magic “normal” number of times a couple should make love that’s a bench mark for every couple. It’s for the two of you to decide how you both want your relationship to be. We realize that an honest discussion about physical intimacy or lack of can be a mine-field and explode in your faces at any time. To avoid any explosions, agree to not blame or guilt-trip each other before you start talking. Also agree to speak honestly and listen to each other without interrupting. Agree that you’re not going to talk about who’s causing the problem but rather where you want to go from here. Talk about the kind of relationship you want and how you want it to be. If there are skeletons that need to come out of the closet–unresolved trust issues or deep resentments that haven’t been tackled–you may need the help of a coach or therapist. If that’s the case, then get into action to find help and be willing to deal with those issues. Don’t hang onto resentments until it’s too late to do anything about them or your relationship. If you or your partner don’t have desire anymore for intimacy and there might be a physical reason, don’t allow that to stop you. Along with possibly getting a physical exam you’ve been putting off or asking the advice of a medical professional, start moving toward one another in other ways. Let’s get real–Because we’re all so busy, leaving love-making and connection up to the “spontaneous moment” usually assures that it won’t happen very often in most relationships. other in a relaxed way. Start with agreeing to be together without interruption for 15 minutes a day if time together is a challenge– and don’t spend it complaining about work, the kids or each other. Spend it maybe physically touching each other and talking about what you like or love about each other. Okay, so we know that if you’re used to sitting in different rooms doing different activities when you’re together and your interactions consist of “What’s for dinner or “Who’s picking up the kids,” our suggestion may be awkward at first. The two of us spend an hour each morning “connecting” which usually means making love but doesn’t have to mean that. The point is to set aside some time to be together so that your intimacy can grow. 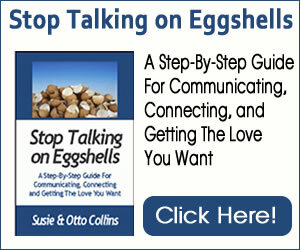 Continually discover and rediscover ways to keep your desire for each other strong. Fanning your desire for each other isn’t a one-shot thing you do for awhile and then go back to the way it was. It’s finding ways to keep your interest and passion alive for each other every day that can make all the difference whether you’re happy in your relationship–or not.